On a February afternoon in 2014 on land behind the Fosse Retail Park in Leicester, my son Harry and I discovered the corpse of a young horse as it lay rotting, while a mare – ‘Hope’ as she was later named – lay dying in floodwater. There followed a rescue attempt with Leicester Fire Service, removing Hope from the water. Sadly despite all efforts, Hope had lost her strength and was mercifully euthanised by a vet. It then came to light that the conditions in which Hope and her herd had been living with were nothing short of lethal. The Facebook campaign, “Help the Horses of Fosse Park, Leicester” and petition were launched, gaining incredible momentum with some 44,000 likes in less than four weeks. The land contained extensive tracts of broken fencing and barbed wire, much of it at hoof height. A bridge spanned a ditch, its iron railings laying as a cattle grid, with the bones of previously fallen horses left to rot beneath where they fell. Water, polluted by petrol, diesel and other chemicals flowed into a drainage ditch which the horses crossed. Rotting hay, which was only fit for burning, being spasmodically fed. The whole area a graveyard with bones left to lie as testament to this vile environment. For years local people have reported to the RSPCA the plight of the horses living on this flood plain yet they were only moved following huge media exposure and an incredibly dedicated team of people driving the campaign. Fosse Park is not a unique situation. Up and down the country horses are suffering the same, if not worse. 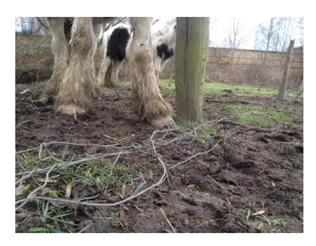 As the family Equus falls into a welfare “no mans land” the RSPCA have demonstrated time and again that they do not deal effectively with the welfare of horses and their kind. So a growing nationwide voice from caring horse lovers is demanding that the government step in and take responsibility (currently expected to be carried out by a charity), and see to it that the 2006 Animal Welfare Act is properly implemented. Is it really too much to ask that all horses kept in domestication have the right to clean water, enough food and a safe environment? Well, I and thousands of others don’t think that’s too much, and we will come together as one voice until we are heard. Thankfully the Fosse Park horses now have a happier and safer solution. So if they can, others can too! Basic welfare should not be a campaign; it should simply and automatically happen for all animals and especially for the Horse who is so badly served at present.